There are many fascinating stories from history just waiting to be adapted into a juicy book, enthralling film, or engaging television series. In many cases, characters and entire plotlines are embellished or created from scratch due in large part to the fact that not every moment is thoroughly or accurately documented, especially when the subject dates back many years. Additionally, the way that people speak to each other and interact can be altered to add to the creativity or entertainment value as guided by the people behind the camera telling the story through the actors playing it out on screen. In the late seventeenth century, Anne (Olivia Colman) is Queen of Great Britain. Much of her decision-making is advised and even directed by Sarah (Rachel Weisz), the Duchess of Marlborough, for whom she harbors considerable affection. 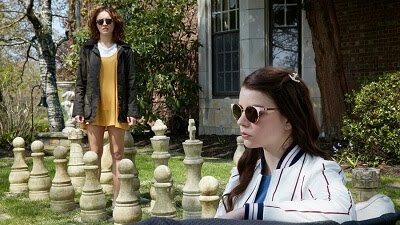 The arrival of Sarah’s cousin Abigail (Emma Stone) initially presents an opportunity for Sarah to keep Anne’s need for attention at bay, but once Abigail, whose station in life has been greatly reduced due to past events, sees the position she is in, she becomes a fierce rival for Sarah. These characters are all real, and the intimacy Anne shared with both Sarah and Abigail is relatively well-documented. As showcased here, however, all three are capable of spitting out extraordinary dialogue that shows just how well-suited they are to their surroundings, far more intelligent than all the men around them and more than ready to go toe-to-toe with one another. It’s a marvelous tale marking the third English-language film from Greek director Yorgos Lanthimos, who hands the screenwriting reins to the very capable Tony McNamara and Deborah Davis. It’s also far more unsettling than “Dogtooth,” “The Lobster,” and “The Killing of a Sacred Deer,” brilliantly transposing his knack for dark humor to this regal, historical setting for a delightfully entertaining trip. All three women in this film are terrific, and the only question come Oscar time will be which categories to place them in since they all have considerable screen time. Colman, who played one queen in “Hyde Park on Hudson” and will soon take over the role of Queen Elizabeth II on “The Crown,” makes Anne into a hilarious presence, reacting purposefully and acutely to everything that goes on around her. Stone, donning a convincing English accent, is considerably more cutthroat than her usual sympathetic characters and gives Abigail a formidable energy. Weisz is quick and unforgiving, and hers may well be the most superb of these three excellent turns. Nicholas Hoult stands out among the male cast for his portrayal of Robert Harley, the leader of the government opposition, who seeks to curry whatever favor he can through less than noble means. The costumes by famed designer Sandy Powell and the wide-lens cinematography by Robbie Ryan help complete this extremely engaging and worthwhile experience, and though its final scene is the weakest point of the film, everything that leads up to it and extraordinary and captivating.